The Energy Combi 25kW gas boiler from Glow-worm is a highly efficient unit which features a variety of benefits for your home. It is a condensing, wall mounted model which has been given an B rating by SEDBUK due to the high efficiency of its operation (89.2%). This high level of efficiency should lower your running costs helping to save you money. This boiler is particularly well suited to smaller properties as it is compact enough to be installed in a kitchen cupboard and has an output rating of 25kW. Not only this, as a Combi boiler it will produce hot water for both your central heating system and taps on demand so there is no need for a storage cylinder. In addition, it takes its water supply directly from the mains so there is also no need for a cold water feed tank in the attic. 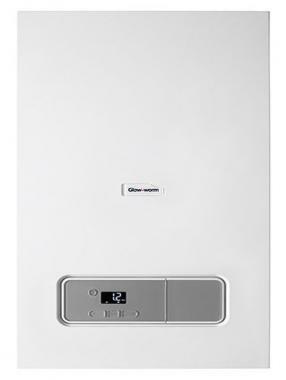 This boiler also comes with a rear flue option and is available in range of outputs including 25kW, 30kW and 35kW. This boiler comes with a 7 year warranty as standard so you can be sure you're getting a highly reliable unit.